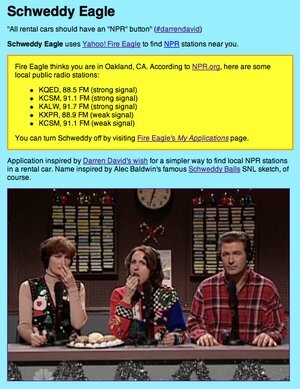 Schweddy Eagle is an application I just wrote that yanks your location from Fire Eagle and tells you what NPR stations are in your area. You could use it with a jesus phone, perhaps in a rental car, to find quality radio wherever you happen to be. It uses the excellent OAuth protocol to safely ask for your current location.